Tamil Nadu is the fourth largest state of India. Located in the southernmost part of the country, Tamil Nadu is surrounded by Andhra Pradesh from the north, Karnataka and Kerala from the west, Indian Ocean from the south, and Bay of Bengal from the east. Tamil Nadu has a diversified manufacturing sector and features among the leaders in several industries like automobiles and auto components, engineering, pharmaceuticals, garments, textile products, leather products, chemicals, plastics, etc. It ranks first among the states in terms of number of factories and industrial workers. 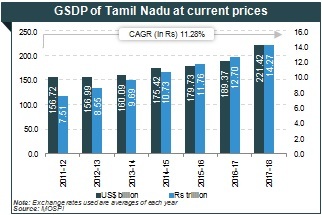 Between 2011-12 and 2018-19, Gross State Domestic Product (GSDP) expanded at a Compound Annual Growth Rate (CAGR) of 11.46 per cent to Rs 16.06 trillion (US$ 222.58 billion) whereas the Net State Domestic Product (NSDP) expanded at a CAGR of 11.45 per cent to Rs 14.41 trillion (US$ 199.69 billion). 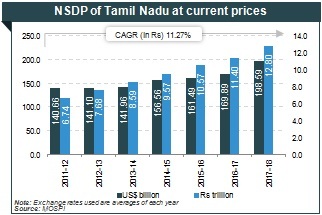 According to the DPIIT, cumulative FDI inflows in Tamil Nadu and Puducherry during April 2000 to December 2018 stood at US$ 29.28 billion. During 2017-18, total merchandise exports from the state stood at US$ 29.75 billion. During 2018-19*, the exports stood at US$ 22.53 billion. Tamil Nadu has a well-developed infrastructure with an excellent road and rail network, three major ports, 15 minor ports, and seven airports across the state providing excellent connectivity. As of February 2019, the state had a total installed power generation capacity of 30.48 GW. Tamil Nadu has 51 formally approved SEZs, 47 notified SEZs and three with in- principle approval SEZs and 40 exporting SEZs, as of January 2019. Tamil Nadu is the largest producer of cotton yarn, accounting for 41 per cent of India’s production. During October-September 2018-19(E), the state is estimated to produce 600,000 bales** of cotton. Tamil Nadu’s tourism industry increased in terms of tourist arrivals to reach 349.92 million in 2017, at a CAGR of 16.48 per cent between 2011 & 2017. Tamil Nadu ranks 1 st in terms of domestic tourist arrivals and 2 nd in terms of foreign tourist arrival in 2017(P). In May 2018, the Airports Authority of India (AAI) got clearance from the Expert Appraisal Committee (EAC) under the Ministry of Environment, of Rs 2,476 crore (US$ 384.17 million) Chennai Airport expansion programme over an area of 1,301.28 acres.